Just a football game? Yeah, but what a game! I haven’t had the words to describe the feeling of the Saturday night massacre at Death Valley. Hearing the “Maroon-White” cheer coming loud and clear over the death rattle of the record 102,000+ fans in tiger stadium was just excellent. I suppose we will have to wait a few weeks to see how good or bad LSU really is before any final placements of this victory in the MSU annals, but for now, it’s pretty sweet. I ran across this article by Kevin Armstrong in the NY Daily News that captured the moment, and gave some insight into the star qb from MSU, Dakota Prescott. BATON ROUGE, La. — In between the hugs and the hallelujahs, the falling tears and players pulling up turf from the Tiger Stadium field, Nathaniel Prescott, a car salesman from Vinton, La. and father of visiting Mississipi State’s victorious quarterback, nudged an East Baton Rouge Sheriff’s officer. He was standing against the fence in the front row of Section 401, just off a south end zone pylon, and pointed toward his son, Dak, celebrating with teammates in the near distance. He requested the lawman pull his son over toward him. “Can you get him?” Nathaniel said. It was minutes after LSU’s last Hail Mary attempt fell to the grass that the Bulldogs chewed up for 570 yards in front of 102,321 fans Saturday night. The officer stepped in the quarterback’s path to the locker room and redirected him. Father and son embraced, father, his dark shades sitting atop a shaven head, repeatedly patting his son, still in pads, on the back. 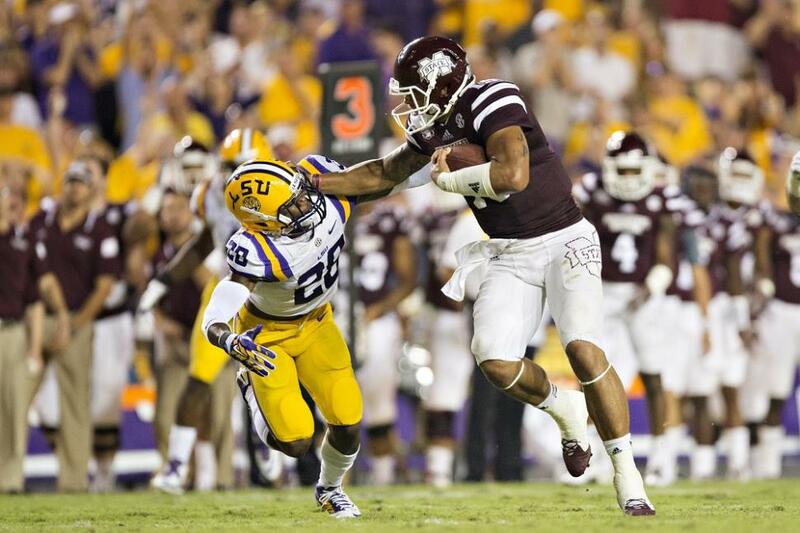 They both wore maroon Mississippi State jerseys, the Prescott surname and No. 15 emblazoned on the backs. For 60 minutes, on his home state’s soil, the younger Prescott strafed the Tigers in the air (268 passing yards), stiff-armed them over the Bengal’s eye at midfield (105 rushing yards) and altogether stunned the No. 8 team in the country, to win, 34-29. The son sprinkled impromptu sprints and deep throws into the contest to sustain long possessions. Father likened the Death Valley scene to a dream. The late Margaret (Peggy) Prescott never got to witness the win she would have preened about the casino, restaurant and truck stop inside the I-220 Travel Plaza she managed. She walked to work everyday in Tiger country, raising her three boys — Tad, Jace and Dak (short for Dakota) — in a trailer at the Pine Creek Mobile Estates in Princeton, La. Tad and Jace shared one bedroom; for the longest time, Dak and his mother shared the other. Peggy provided for all of them and spoiled her youngest son. “Every time I looked around it seemed like Dak had a new bike,” Tad said. Her lasting gift was maintaining a motherly presence, offering a firm-but-fair model after divorcing Nathaniel when Dak was a toddler. Eventually, Nat returned to find Peggy weakened by colon cancer’s metastasis. Last season, he pushed her around games in a wheelchair, but she died last November, felled by cancer’s toll on the day after Mississippi State’s 34-16 loss on the road against South Carolina. Dak threw three interceptions and lost a fumble against the Gamecocks. He learned of her death over the phone from his father. She died at home. Dak was with Mississippi State coaches in their office at the time, the men his mother entrusted her son’s care with three years earlier. Mississippi State (4-0) and Prescott made their moves onto the national scene in sync. The Bulldogs leapt to No. 14 in the polls this week, and Prescott (6-foot-2, 230 pounds) catapulted into the Heisman Trophy conversation. It was the first time Mississippi State had claimed victory at LSU in 14 years, the first time an LSU team lost at home on Saturday night to a team not ranked No. 1 in coach Les Miles’ 10 seasons, the first time the Bulldogs beat a top-10 team on the road since 1986. Prescott, once recruited by Miles and LSU out of Haughton (La.) High, proved himself at home on the stage, marching 98 yards against LSU on one drive, ad-libbing and dropping off a 74-yard pass, taking off on a read-option run of 56 yards, dodging defenders and diving into the end zone. He absorbed blows, then sped past defenders into the secondary and beyond, collecting yards after contact by the dozen. Father had flashbacks to his son’s childhood. Prescott claimed clairvoyance at the line of scrimmage. “I pretty much knew everything they were coming with before the snap of the ball,” he said. Tad made sure his mother’s memory was recalled at Tiger Stadium. He works at Gordon’s jewelry store in Orange, Tex., and had two silver medallions with gold crosses made up recently. The “Lord’s Prayer” is engraved on the front, and his mother’s initials appear on the back. He also formed a second with the words “Fight and Finish” on Dak’s. He gave him the necklace as he got off the team bus Saturday. Dak wore it during the game, then switched with Jace afterward. All three brothers embraced in a darkened tunnel by the visitors’ locker room afterward. Tad took out a patch of LSU grass from his jeans pocket. His mother, who was cremated, per Native American tradition, told her boys to plant her ashes with a flower once they owned houses. Tad noted that the pairing of his mother’s remains with the turf his brother leveled the Tigers on might make a proper burial site. “She wanted us to watch a new bloom every year,” Tad said. AUSTIN — The special prosecutor in the case against Gov. 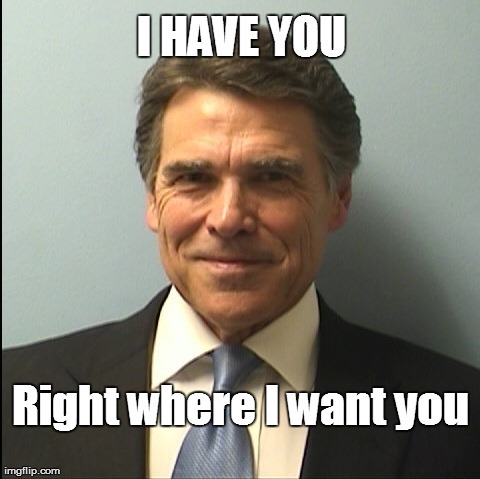 Rick Perry is asking for some help. Sounds ominous, that the Governor’s legal team is actually fighting back with motions and the libturd’s hand picked lawyer is overwhelmed with answering…both of them. As mentioned in another post, this was never about Gov. Perry violating the constitution, it was about violating the law of the libturds which states their officials can never and should never be held to any societal standards or laws that the “little people” should. Perry, it seems, committed the unpardonable sin of holding the DA responsible for drunkenness. How dare mere mortals hold the people responsible for prosecuting crimes to a standard that applies to the rest of us? To further illustrate how low the chances are of Gov. Perry being convicted are, it seems the aforementioned Michael McCrum is facing very serious contempt of court charges. Prosecutors filed a contempt of court motion against San Antonio-based attorney Michael McCrum in January, after a separate case the previous fall. In it, one of McCrum’s clients was convicted of manslaughter for driving his car the wrong-way down an interstate with a blood-alcohol level three times the legal limit, and sparking a head-on crash that killed two men. McCrum was accused of telling his client’s former addiction counselor to “get lost for a while” and not be available to testify at the trial’s punishment phase. Yes, Gov. Perry has reason to smile, the smell of libturd fail has that effect on reasonable people. *Last meal:For her last meal, Lisa Coleman was served a fried pork chop, macaroni and cheese, carrots, green beans, navy beans, sliced bread, and pineapple orange cake, with a choice of tea, punch, or water to drink(per Last Suppers). *Last words:Her last words were directed at her fellow inmate, Darlie Routier(murderer of her own children). ‘Tell them I finished strong,’ she said. As our friend Robbie used to always say, “some people are just no damned good.” Truer words have never been spoken when Lisa Ann Coleman is concerned. The facts of the case can be found HERE, but to summarize she brutalized and starved to death a nine year old boy. 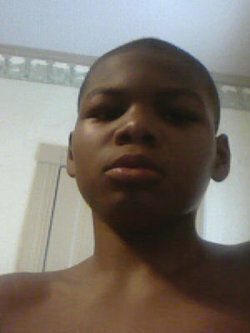 Crime Scene Investigator Regina Taylor testified that Davontae had “numerous injuries throughout … his entire body,” including a disfigured ear, swollen hands, a slit in his lip, and “ligature marks around his wrists and ankles.” Pediatrician Nancy Kellogg identified over 250 wounds on his corpse. Dr. Konzelmann testified that injuries to Davontae’s hands, arms, and ankles were consistent with his having been bound repeatedly. Konzelmann initially believed that Davontae had “life-threatening blunt-force injuries, perhaps bleeding on the brain, broken bones, et cetera” that caused his death. Ultimately, however, Dr. Konzelmann deemed the cause of Davontae’s death to be malnutrition with pneumonia. The young boy wasn’t her son, not even a blood relative, but the son of her homosexual lover, Marcella Williams. The facts of the case and the procedural history give no weight to her sexual preference or her race, but that hasn’t stopped an absolute loon for a lawyer, John Stickles, from going where no death penalty opponent has gone before. “What she’s really guilty of is being a black lesbian,” Stickels said. “If she is executed, it will be because of her sexual orientation. Her sexual orientation played a role in the state choosing to seek the death penalty and in her getting the death penalty. For someone to knowingly and willingly harm a child in any way already puts them on my bad side. Starving to death while torturing this young boy is unforgivable and I sincerely hope all her sick lawyer’s tricks are exhausted so she can receive the justice she has earned and that society demands. NCAA Football: An Upset In Norman? In football, almost any outcome is possible, even if not very likely. Here we have John Adams of the Knoxville News(Tennessee) break down for us the reasons why the Vols could upset OU. His research and unfettered confidence in the Vols is commendable. *Last meal: TBA, no special requests allowed. It has been nearly twenty one years since Trottie was sentenced to death by a Harris County jury. That jury issued their sentence only seven months after his double murder. It is truly unfortunate that it is taking this long for justice to be served. There is no dispute in his guilt, there were numerous witnesses to the crimes and he drove himself to the hospital in one of the victims car for a gun shot wound. The new ad campaign launched by the NRA is different than anything I’ve ever seen. I was watching the news the other day and saw an ad, it stopped me in my tracks. The words spoken by the narrator could have been my own. It was almost like the first time I heard Rush Limbaugh on the radio, and I was pleasantly surprised that someone could so eloquently express the same thoughts that had been swirling in my mind for so long.